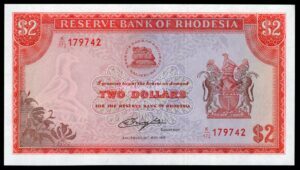 Rhodesia: Reserve Bank. 5 dollars. 1-3-1976. M/14 784902. (Pick 36a). GEF. 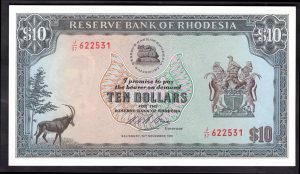 - M Veissid & Co.
Rhodesia: Reserve Bank. 5 dollars. 1-3-1976. M/14 784902. (Pick 36a). GEF. 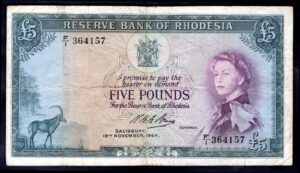 Rhodesia: Reserve Bank. 5 dollars. 1-3-1976. M/14 784902. (Pick 36a). Pinhole. Slight denting and creasing. GEF. 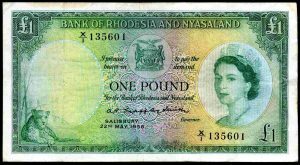 Rhodesia & Nyasaland. One Pound, X/1 135601, 22-5-1956. Fine. 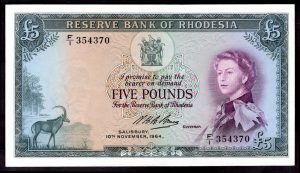 Rhodesia; Reserve Bank. 2 dollars. Series K/172. 24-5-1979. (Pick 39b). AU-UNC. Rhodesia. Ten Dollars, J/37 622531. 19-11-1975. Nearly Extremely Fine. Rhodesia. Five Pounds, F/1 364157, 10-11-1964, better than Good Fine.